Ed. 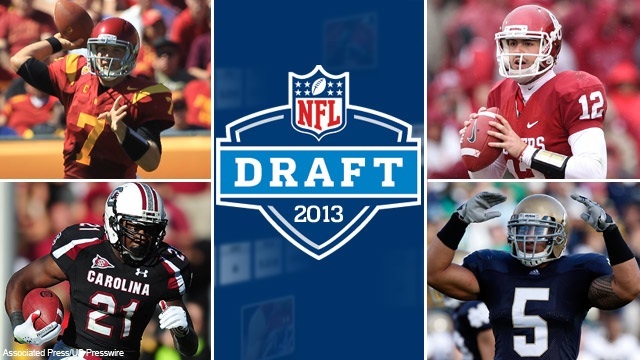 note – WARR is receiving special NFL Draft coverage (1st Round- Thursday, 7 pm) from Corey Carmona, Director of NCAA Football for Full Scale Sports. Here Corey offers up his final Mock 1st Round, you can catch more of his inexhaustible draft coverage on fullscalesports.com as well as a special Q & A here on WARR later this week. 1. Kansas City Chiefs-Luke Joeckel-OT-A&M The Chiefs and new head coach Andy Reid have made it clear that they would like to go from a “finesse” running team to more of a power style. That leads me to believe they’re going to part ways with their left tackle Branden Albert, who is known as a finesse blocker rather than a power guy. Joeckel is excellent in the run game and will serve as a great bookend tackle for whoever plays quarterback for the Chiefs in 2013. 2. Jacksonville Jaguars- Dion Jordan-DE-Oregon Jordan is a straight up freak of nature, this guy has superstar written all over him, he’s 6-7, 240 and runs a 4.58 in the 40 yard dash. HELLO!! This kid is special and you can’t pass up a talent like this, he’s got the speed & quickness to be not just an elite pass rusher but an elite run stuffer also. Like I keep saying you can’t pass up elite pass rushers in this day and age and Jordan is exactly that. 3. Oakland Raiders- Shariff Floyd-DT-Florida The Raiders are a team that has a ton of holes and they can’t stop anybody on the ground. Oakland gave up 122 yards a game in a division with backs such as Jamaal Charles, Ryan Matthews and the way Denver likes to run the football you’re going to need to sure up the front 7, that starts with Floyd. 4. Philadelphia Eagles-Eric Fisher-OT-Central Michigan The Eagles NEED to protect Michael Vick in 2013, anyone who disagrees needs to be checked for mental issues. Fisher gives them a bookend left tackle that the franchise desperately needs. I don’t care how innovative Chip Kelly is, you can’t win in the NFL if you can’t protect your quarterback. 5. Detroit Lions- Ezekiel Ansah-DE-BYU The Lions parted ways with both of their veteran pass rushers this off-season so it makes sense to go after an elite pass rusher with their first round selection. 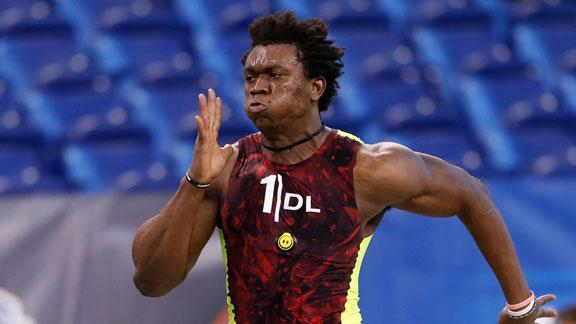 BYU Defensive End Ezekiel Ansah runs the 40 yard dash at the Draft Combine. 6. Cleveland Browns- Dee Milliner-CB-Alabama I’m not sold on Milliner but I do believe he’s the most complete corner in this draft. He has the ability to cover a number 1 or 2 wide-out and is physical enough to help in run support. I often hear the term “shut down corner” with Milliner – he is not a shut down corner at the next level (that phrase is used way too much now a days), but Milliner will be good. With quick hips, a great understanding of the game and pretty good ball skills, he should be a starter for years to come. 7. Arizona Cardinals- Lane Johnson-OT-Oklahoma Everyone seems to think the Cardinals are taking a quarterback here but in today’s NFL you have to protect your signal caller and the Cardinals offensive line is below poor. I think they’ll go with a quarterback in the 2nd and take Johnson with the 7th overall pick. 8. Buffalo Bills- Chance Warmack-OG-Alabama In my opinion, Warmack is the best offensive lineman in this draft. The Bills need interior help on the line and I think they go with Warmack here. 9. New York Jets- Jarvis Jones-OLB-Georgia Mr. Pass Rush himself! Jones is a future STUD! 14.5 sacks this year and he missed two games! In a league where the passing game is becoming more relevant, elite pass rushers have become such an important commodity and this is why I believe the Jets take Jarvis Jones. 10. Tennessee Titans- Star Lotulelei-DT-Utah A star in my opinion. Could go number 3 to the Raiders or fall as far as 10 to the Titans, either way I believe he’s going to be a stud. 11. San Diego Chargers- Jonathan Cooper-OG-North Carolina The Chargers need offensive line help in the worst way. I could see them trading up to get one of the top 3 tackles but with each of them off the board, I think they’ll be satisfied with Cooper. 12. Miami Dolphins- Desmond Trufant-CB-Washington The Dolphins need a number one corner, I could also see them trading up to get one of the tackles but if they stay at 12, Trufant would be a great pick. Trufant really helped himself with the Senior Bowl and the combine, this kid is physical in the run game like a downhill safety and has the ball skills of a cover corner. He works well in zone as well as man schemes, I think he’ll be a good fit for that Dolphins defense going forward. 13. Tampa Bay Buccaneers- Sheldon Richardson-DT-Missouri Tampa looks to be close to securing Revis so this pick may go to the Jets (Ed. note- Tampa has secured Revis and the pic is now NY’s), if that doesn’t happen look for the Bucs to take Richardson here. 14. Carolina Panthers- Kenny Vaccaro-S-Texas Vaccaro is in my opinion the best safety in this year’s draft. I could see the Panthers going defensive tackle in the first round, but there’s a lot of buzz coming out of Carolina about Vaccaro and I think it’s a perfect fit. 15. New Orleans Saints- Barkevious Mingo-OLB-LSU The Saints are converting to a 3-4, with that you need pass rushers and Mingo definitely fits the build. Some scouts worry that Mingo is a little light and a bit raw but the Saints can bring him along slow and just use him on pass rushing downs until he becomes a solid run stopper. The Saints could look to go nose tackle with this pick also but if I’m them I’m taking a pass rusher. 16. 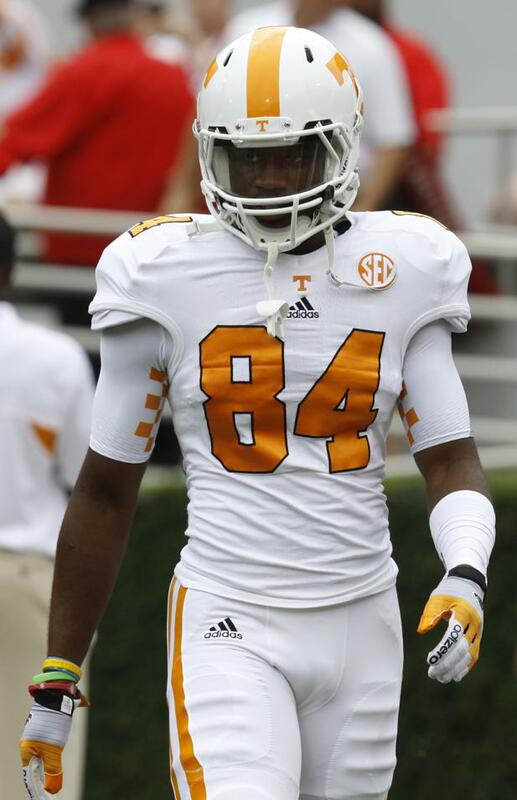 St. Louis Rams- Cordarrelle Patterson-WR-Tennessee The Rams desperately need a number one receiver. Patterson is kind of raw but with his big play speed and good hands he should be a good addition to this offense. I worry about Patterson because he seems to be very green but he reminds me a lot of Julio Jones when I put on the tape, I really think he’s going to be a stud. 17. Pittsburgh Steelers- Tavon Austin-WR-West Virginia With the Steelers losing Mike Wallace this off-season and Emanuel Sanders hitting free agency next year I think they take a look at a wide out in the first. With Austin on the board I think the Steelers have to take him. Not only did this kid catch over 100 balls this year, he ran the ball 73 times and averaged 8.9 yards a carry. Big Ben should be jumping for joy if this kid is here at 17. Austin could give teams trouble with the underneath stuff, not to mention he’s a weapon in the running game. 18. Dallas Cowboys- Margus Hunt-DT/DE-SMU Hunt is a freak of nature andva raw freak of nature at that. He’s a project for an NFL team but at this position this guy is a potential steal. Measuring 6’8, 280 with moves like a wide out on the field, he can play in a 4-3 as a defensive end or be bumped inside. This is a guy you can mold into whatever your team needs: although he’s raw, Hunt’s eight sacks as a senior show you his pass rushing skills, his best asset however is his motor. Hunt hustles on every play no matter where the play is going and that’s what you want out of a young pass rusher, whatever team takes Hunt and coaches him up will have a budding star on their hands. The more film I watch on Hunt the more comfortable I get with this pick. 19. New York Giants- D.J Fluker-OT-Alabama I could see the Giants going with a right tackle or an inside linebacker here. Since there’s a ton of depth at linebacker, I think they’ll take Fluker if he’s here at 19. 20. Chicago Bears- Alec Ogletree-ILB-Georgia Ogletree is a 6’3, 232-pound athlete that played safety but was converted to inside backer for Georgia, where he excelled to say the least. Ogletree has sideline-to-sideline speed and he also possess the toughness to fill gaps, I think he’s a better fit for a 3-4 scheme but he’ll excel in Chicago. 21. Cincinnati Bengals- Matt Elam-S-Florida The Bengals struggled in the back-end at times this year, so much so that they had to bring Chris Crocker out of retirement to sure up their secondary. Guys like Taylor Mays just can’t get it done. Reggie Nelson is an above average guy back there, you pair him with an aggressive guy like Matt Elam and you have a good pair of young safeties going forward. Elam is stout in run support and shows pretty good ball skills. Playing under experienced defensive coordinator Mike Zimmer should turn this guy into a stud. 22. St. Louis Rams (from Washington Redskins)- Eric Reid-S-LSU Reid is a ball hawk with the toughness to stick his nose in for run support, in my opinion he’s one of the best safeties in the draft. He’s has the physical tools and playing safety on that LSU defense means he was their on-the-field coach. The Rams have two excellent corners (Janoris Jenkins, Cortland Finnegan), pairing Reid with those guys would give coach Jeff Fisher one of the best young defensive backfields in his division. 23. Minnesota Vikings- Manti Te’o-MLB-Notre Dame The Vikings need a middle linebacker, I understand all of the negative press that comes with Te’o but all of that will go away once he plays. I think he’s going to be a productive linebacker for years to come & all of the hoax stuff will blow over. 24. Indianapolis Colts- Datone Jones-DE-UCLA Jones is a 3-4 defensive end out of UCLA with some serious talent. He’s very versatile, kind of like Antonio Smith of the Texans. Jones gives you a guy that can play the five technique and bump down inside when you need him to. While Jones doesn’t have the speed off the edge I think he’ll be a pretty good pass rusher from that 5 technique. 25. Minnesota Vikings (from Seattle Seahawks)- Bjoern Werner-DE-Florida State Warner, in my opinion, is the best pure 4-3 defensive end in the draft. He’s got that big frame, long arms, quick burst and has the power to make plays in the run game, not to mention he’ll be a great compliment to Jared Allen. 26. Green Bay Packers- Shamarko Thomas-S-Syracuse This is the biggest reach of this mock. I have Thomas as a top of the 2nd round talent, but he’s PERFECT for the Packers system. Thomas can fill that Charles Woodson role and be that force in the box as well as a play maker in the passing game. Like I said its a bit of a reach to take him in the first round but he definitely won’t be there when the Packers pick in the second, so I say take him. 27. Houston Texans- Keenan Allen-WR-Cal The Texans need another wide out, Allen is a 6’3, 206-pound junior out of Cal that would fit perfectly in their system. Allen is your prototypical number one or number two receiver- he’s got a big frame, good foot speed, he runs smooth fluent routes and attacks the ball when it’s in the air. With Allen, DeVier Posey and Keshawn Martin, the Texans could have their receiving core set for the future. 28. Denver Broncos- Damontre Moore-OLB-Texas A&M In my opinion, this is one of the biggest steals of the first round. Moore is going to be an elite pass rusher in the NFL, quote me on it. Putting him on the other side of Von Miller gives Denver two young bookend pass rushers. 29. New England Patriots- Robert Woods-WR-USC SPEED KILLS and Woods has lots of it. Woods is a guy I believe can come in and make an instant impact on this roster. He’s has big play speed and isn’t afraid to run the routes in between the hashes. With the Patriots going after Emanuel Sanders I’m guessing they’re looking for a big play threat to pair with him, Woods can be that guy. 30. Atlanta Falcons- Alex Okafor-DE-Texas Okafor is a guy I’m really high on, this kid can do it all and then some. Okafor is stout against the run and excellent at applying pressure. The Falcons have to fill John Abraham’s role for next year and I think Okafor is their guy. 31. San Francisco 49ers- Phillip Thomas-S-Fresno State Thomas is an absolute ball hawk and for that reason I think he goes here to the 9ers. San Fran lost Pro Bowl safety Dashon Golson to free agency this off-season (Tampa Bay) so it makes sense to grab a safety here with the 31st pick. 32. Baltimore Ravens- Deandre Hopkins-WR-Clemson The Ravens need to replace the production they got from SF-bound Anquan Boldin. Hopkins looks like Boldin 2.0. I could also see the Ravens looking at a safety or a inside linebacker with this pick, but for my money I like them to go with Hopkins. ← Blacks and Baseball… Is Roc Nation Sports the Missing Piece?